Sorry, sorry… too obvious. Thanks to some friends on Facebook, we stumbled across an upcoming fantasy film called Hanson and the Beast — from China, no less. Drama Panda has a preview. The story goes like this: “Yuan Shuai (Feng Shaofeng) is a a man who is drowning in debt. In order to pay up, he goes on blind dates with daughters from wealthy families but ends up falling in love with Bai Xian Chu (Crystal Liu), a fox demon who’s come to the human realm to repay a debt. However, relationships between humans and demons are strictly forbidden. Bai Xian Chu is dragged back to the demon world and Yuan Shuai sets out to rescue her.” So who’s Hanson? We don’t know yet. 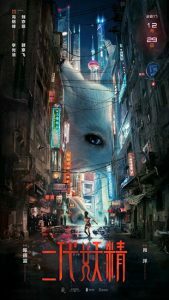 Written and directed by Xiao Yang, Hanson comes to theaters in China right at the end of December, then everywhere else on January 5th. Check out the trailer on YouTube as well. Where's the Dragon? In Beijing. 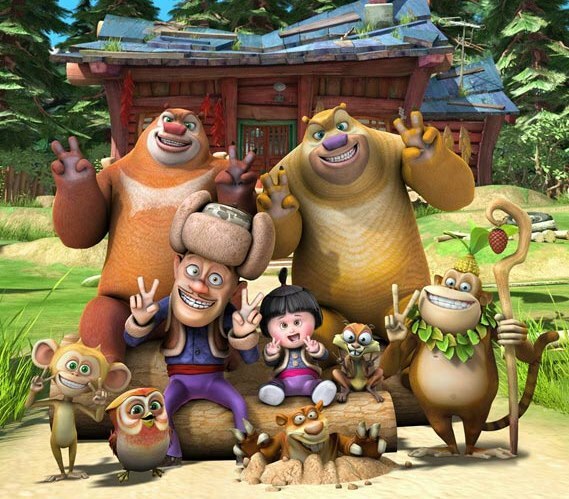 Chinese animation is still getting erratic publicity in America. 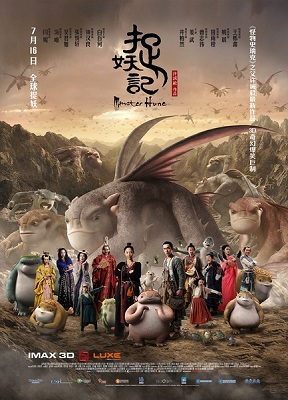 Despite the recent news about the forthcoming release of the Little Door Gods CGI movie on January 1, 2016, America has just learned of the theatrical release in Beijing on this October 14 of the family (children’s) CGI-animated feature Where’s the Dragon?, with a nationwide (in China) release on October 23. The only news so far is from Animation World Network; it’s not even on IMDb yet. AWN’s announcement on October 12 says that Where’s the Dragon? 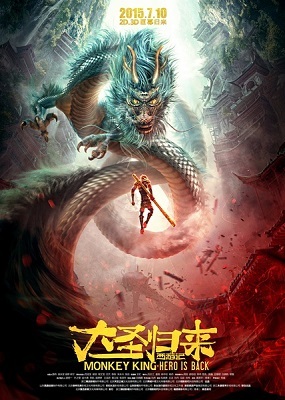 is directed by Sing Choong Foo, co-produced by the DeTao Group and Treasure Tree Studios, Inc., plus Hong Kong's Where's the Dragon? Co., Ltd. and Colour Engineering Ltd., and distributed by a Hong Kong company, SMI Movie Distribution Company, Ltd. Here is another anthropomorphic animated movie trailer! Little Door Gods may not seem anthro at first glance, but look at the frogs in the background. 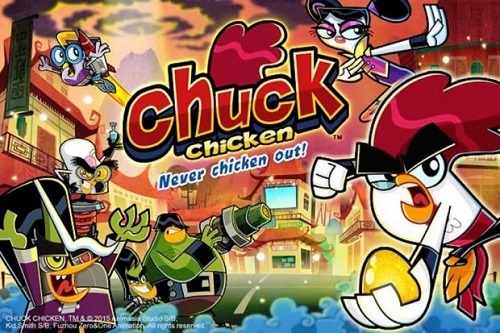 Then take a closer look at the main characters, especially Shen Tu (the fat guy). These aren’t humans, they’re Chinese door gods (ménschén); the little anti-evil charms that the Chinese have traditionally posted at their front doors. Modern Chinese no longer believe in them and have stopped using them. 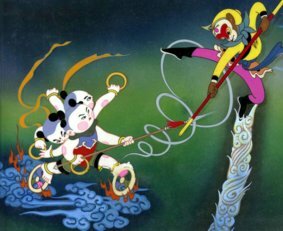 Light Chaser Animation in Beijing has used this as its plot for this movie: what happens to the door gods in the spirit world when humans no longer believe in them? Brother door gods Yu Lei and Shen Tu are worried about being thrown out of work. The comic-relief Shen Tu is fatalistic about it, but Yu Lei determines to journey into the human world and cause enough commotion to prove to mortals that they still need the door gods. Amid Amidi reports on the Cartoon Brew website that China’s first CGI feature, the 70-minute Boonie Bears: Homeward Journey, is coming to the U.S. on January 6. If three days sounds like very short notice, it’s because Boonie Bears: Homeward Journey will not be a theatrical release. It’s coming direct-to-DVD. What’s more, this was not even a theatrical release in China. It was a Chinese TV special last Spring. How many stories and videos titled A Fox Tale or Tail have there been? Here is one more, courtesy of the Cartoon Brew website, from student animators Thomas Bozovic, Alexandre Cazals, Julien Legay, and Chao Ma in 2011 at France’s Supinfocom Arles.